New Montana METALLIC Effect Sprays - Available Now! The new Montana Metallic Effects – Available NOW! For many years industry has enjoyed a wide array of metallic colors that were durable and functional for everything from furniture objects, to the auto industry. 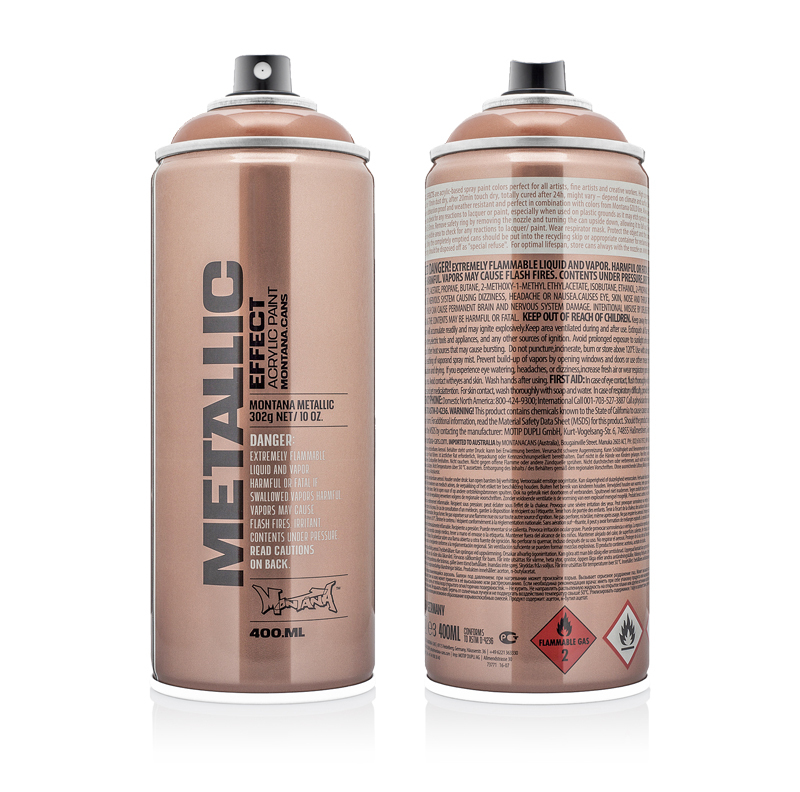 This state of the art technology is now available in the renowned Montana user friendliness, in the new Montana METALLIC EFFECT spray range. Introducing 9 new lightfast metallic colors; Metallic Gold /Champagner /Copper /Ice Blue /Tennessee /Caribbean /Silver /Graphit /Black, delivered reliably under medium pressure output, in a Acrylic- Nitro Combination base. The semi-gloss finish offers an aesthetic, durable, closed paint surface that is both hard wearing when cured (24+ hours drying time) as well as flexible. The Montana METALLIC EFFECT Sprays can be applied to almost any surface including functional or artistic substrates. Whether it be bike frames, furniture, paper, cardboard, canvas, wood, glass, metal, ceramics, porcelain, stone, acrylic or any generally paintable materials. The Montana METALLIC EFFECT range can also be combined with Montana GOLD, Montana BLACK sprays as well as the Montana ACRYLIC marker lines. Available now so you can add a little metallic flavor to your creative pallet. Introducing 9 new lightfast metallic colors; Metallic Gold /Champagner /Copper /Ice Blue /Tennessee /Caribbean /Silver /Graphit /Black, delivered reliably under medium pressure output, in a Acrylic- Nitro Combination base.